Ab15680 detects murine MHC class I molecules on the surface of cells of the following haplotypes: H-2Fv, H-2Dd,H-2k,q,sp,r,w7,w22. MHC class I molecules of other haplotypes are not recognized by the antibody. Our Abpromise guarantee covers the use of ab15680 in the following tested applications. IHC-Fr 1/200. Acetone fixation recommended. MHC Class I molecules play a central role in the immune system by presenting peptides derived from the endoplasmic reticulum lumen. MHC class I antigens are heterodimers consisting of one alpha chain (44kDa) with beta 2 microglobulin (11.5 kDa). The antigen is expressed by all somatic cells at varying levels. MHC Class I molecules are expressed on most nucleated cells where they present endogenously synthesized antigenic peptides to CD8+ T lymphocytes, which are usually cytotoxic T cells. Fibroblasts or neurons however only show a low level of antigen. Cell Membrane; Type I membrane protein. Frozen section of mouse spleen tissue stained for MHC class I using ab15680 at 1/400 dilution in immunohistochemical analysis. Publishing research using ab15680? Please let us know so that we can cite the reference in this datasheet. Inquiry: Hi, I would like to know if ab15680 will recognize MHC class I haplotypes in C57BL6 mice. I contacted the laboratory to clarify the specificity of Anti-MHC class I antibody [ERMP42] (ab15680) for you. I can confirm that the ab15680 does not react with MHC class I haplotypes in C57BL6 mice. I can recommend reviewing the datasheet of Anti-MHC class I antibody [ER-HR 52] (ab15681) on this occasion which does react with C57BL6 mice. Dear Sir or Madam, I would like to use the antibody for detection of H-2Dd on mouse tissue. I would like to use existing FFPE sections. Has the product been tested for that application (it says that acetone fixation is recommended)? What kind of antigen retrieval would be necessary? ab15680 - Detects MHC class I of the 3T3 haplotype (H-2q), but not human MHC. Click here (or use the following: https://www.abcam.com/index.html?datasheet=15680). Click here (or use the following: https://www.abcam.com/index.html?datasheet=98386). For detection of a protein on A549, I recommend anti-EGFR, ab130738. This is conjugated to phycoerythrin. Using these two antibodies, you should be able to sort A549 from 3T3. However, we do not guarantee exclusive species reactivity. In the past, it has been observed that ab15680 does not react with human cells and ab130738 does not react with mouse cells, but neither has been tested against these two particular cell lines. I hope this helps. Please let us know if you have any other questions. What was the result of the human testing? Thank you for your enquiry. 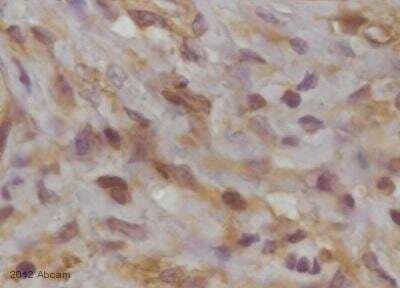 This antibody was tested on human tonsil and skin but unfortunately, there isn't any staining on both tissues. Therefore, we have stated on the datasheet that this product does not react with human. I have tissue that contains both human and mouse cells. I am searching for antibodies that are universally expressed and can reliably differentiate mouse tissue and human tissue. I found an MHC Class I antibody (ERMP42), ab15680, on your website that reacts with mouse but not human. Would you suggest this one for my application? Do you have an MHC Class I antibody that reacts with human but not mouse? I have summarized my questions below: I would like to order an antibody, ab15680 (MHC cl I), but have some technical questions first. The requests that I have for ordering this antibody is that it shold be able to use in immunohistochemistry and I also need the protochol for this application (microwave/enzymatic). According to the datasheet it can be used on IHC-P: If this is immunohistochemistry on formalin,pfa or alchohol fixed tissue embedded in paraffin please confirm this. I would also like to know the precentage of mouse cells the antibody is expected to stain in an immunocytochemical application (if possible). Thank you for your enquiry, we have just received the following information: We have found in our lab that the antibody does not react on routinely fixed paraffin sections (4% formalin). However, from personal communications it seems that the antibody works after more gentle fixation (1% formalin or glutaraldehyde). A higher antibody concentration than what is recommended for frozen sections would have to be used (1:20 or 1:50 and up), we suspect. 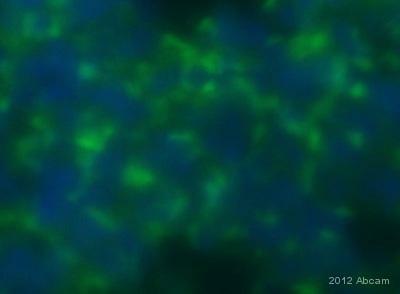 We have found that this antibody stains the vast majority of cells in tissues and bone marrow smears. It also depends on the mouse strain used: ab15680 detects murine MHC class I molecules on the surface of cells of the following haplotypes: H-2Fv, H-2Dd, H-2k,q,s. A weaker reactivity is found in mouse strains with the following haplotypes: H-2 p,r,w7,w22. MHC class I molecules of other haplotypes are not recognized by the antibody. Please do not hesitate to contact us again if you need further details of wish to check whether the antibody will react in your mouse strain.